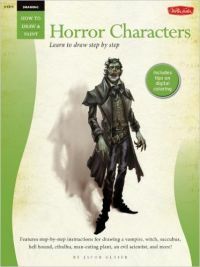 From a zombie straight out of a horror flick to a boogeyman who lurks in the deep corners of the imagination readers can bring to life a frightening array of dark creatures with this in-depth guide. Talented fantasy artist Jacob Glaser instructs with clear step-by-step demonstrations and engages the reader by providing the "history" of each character. Several projects also share the secrets to enhancing a final drawing with digital coloring. Jacob Glaser is a professional illustrator who lives in Long Beach CA. After earning his BFA in illustration he worked at several companies as a staff artist and art director before becoming a full-time freelance illustrator. Jacob believes in aliens ghosts and all sorts of magical nonsense--possibly because he played Dungeons and Dragons too often in high school.